Are you ready to be a winner?! Play Lady of Egypt for your chance to win exciting prizes! There are loads of exciting features that makes this game extra special and extra fun! To find out, just spin the reels and see what you’ve won! Scientific Games takes you to Egypt, with their latest slot addition, Lady of Egypt slot! Cleopatra is featured on this 10 reels and 9 payline game, which comes with an array of top slot features. On the gorgeous display of the game, you can trigger amazing wins and awesome bonus rounds! Start playing Lady of Egypt by toggling your stake on the Bet/Line Field. Click on the minus or plus buttons to accordingly adjust your preferred bet. There’s also an Autoplay Tab which gives you the chance to choose a number of spins to be played handsfree. Amount of Paylines Selection: The 9 paylines are active all the time and cannot be altered. Coin Values: Stakes vary from £0.35 to £175.00 as per your preference. The Golden WILD Logo is the wild of this slot game. This symbol appears only on reels 2, 4, 6 and 8, and takes the place of any other symbols apart from the scatter. 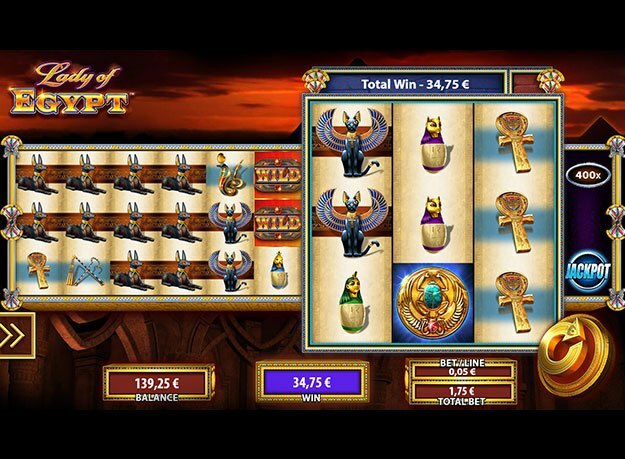 The scatter of Lady of Egypt Slot takes the form of the Golden Eagle. When 3 or more symbols appear anywhere on the reels, the Free Spins Feature is triggered. This award 16 free spins with 25x multipliers, 12 free spins with 10x multipliers or 8 free spins for 3, 4 or 5 such symbols, respectively. The Speed Active Reels move by two reels to the right hand-side to give expanded pays. Each payline comes loaded with Speed Spin with multipliers of 5x and can be triggered at any moment. You can win 5x your bet when these symbols shift to the 10th reel, if you get a win or an expanded pay win. There are three jackpots which can be triggered at random on Lady of Egypt slot and these are: Grand, Major and Mini.